Description: OpenSS7 SS7 Stack Overview. The SS7 Stack has been the principle focus of the OpenSS7 project for some time. The SS7 stack components provide the various protocol levels of the SS7 protocol. These include MTP Level 2, MTP Level 3, SCCP, TCAP, ISUP and BICC. The SS7 Stack Manager is a project to provide configuration and management tools for the OpenSS7 SS7 stack. 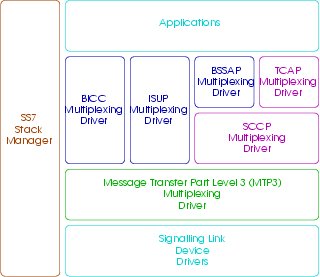 The BICC project is to provide a STREAMS multiplexing driver similar to the ISUP driver that provides the BICC protocol module. This is somewhat similar to the ISUP multiplexing driver. The ISUP project is to provide a STREAMS multiplexing driver which will provide the ISUP protocol modules. This includes continuity testing and circuit management functions. The BSSAP project is to provide a STREAMS multiplexing driver that will provider the BSSAP protocol module. This includes paging and call control functions and will act as either BSS or MSC. The TCAP project is to provide a STREAMS multiplexing driver which will provide the TCAP protocol module. This does not include specific application parts that might make use of TCAP. The SCCP project is to proivde a STREAMS multiplexing driver which will provide the SCCP protocol modules. This includes both connectionless and connection oriented protocol classes. The MTP3 project is to provide a Message Transfer Part (MTP) Level 3 (MTP3) multiplexing driver which will proivde the MTP protocol modules.